Payment: All listed prices are cash prices. Payment is by Money Order, Cashiers Check or Personal Check. Visa and MasterCard credit cards can be used with a 3% convenience fee. PayPal can be used for some items. (Usually just for Optics , barrels, magazines and similar parts. Firearms and some parts are not allowed under PayPal policy) Please let us know if you would like to pay via PayPal. Shipping: The shipping charge will be listed in each description. It is $30 for most guns. Some heavy guns or those insured for over $2000 may be higher. Shipments to Alaska and Hawaii aren always higher because air shipment is required. Most firearms are shipped within 5 days of receipt of payment. We prefer shipping at the beginning of the week to avoid firearms in transit over weekends. We package all shipments carefully and insure them for the full purchase price. In the unlikely event that damage occurs, it is important that you save all packaging material for the claims process. Optics are shipped Priority Mail and most other non-firearm shipments are shipped First Class. Returns: Our return policy is simple. If for any reason you are not pleased with your purchase, you may return your item for a refund. The only exception is ammunition, it cannot be returned. It is important to us that you are happy. Grading and describing used firearms is subjective and especially with collector quality guns, different people have different expectations. Any time you buy a gun without seeing it in person, you should have the option of returning it. You will always have that option at Shooting Investments. Guns cannot be fired or dissembled before returning them and must be returned in the same condition as received. Notification of a return must occur with-in 3 days of receipt at your dealer. Shipping and dealer fees are not refundable and are the responsibility of the buyer. Lay-a-way: If needed, we offer a 60 day lay-a-way option on most firearms. It is 1/3 now, 1/3 in 30 days and 1/3 in 60 days. Lay-a-way firearm sales are final. Trading: We collect guns and usually just trade for guns we want to add to our collections. We often sell guns for others wanting to purchase one of ours. We find this the most fair to both of us. Our Commission is only 10% and we hold the gun you want until yours sells. Please contact us if you want to sell one of yours to buy one of ours. Help for California Buyers: We are happy to ship to California. It is the buyer's responsibility to make sure any item you buy is legal in your state. We are also happy to help with your purchase of a firearm from someone other than us. 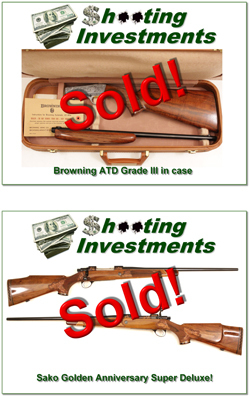 If you see a gun you would like to buy but the seller can't or won't ship to California we can help. You buy the gun and have it shipped to us. We'll then ship it to your California dealer. The cost for this service is only $30 + shipping. Let me know if we can help!